A spot where young folks gather, lovers linger, kids romp, women show off their new clothes (and discreetly admire passers-by), men admire passers-by (and discreetly show-off their new clothes) and everybody feels part of the wider community. 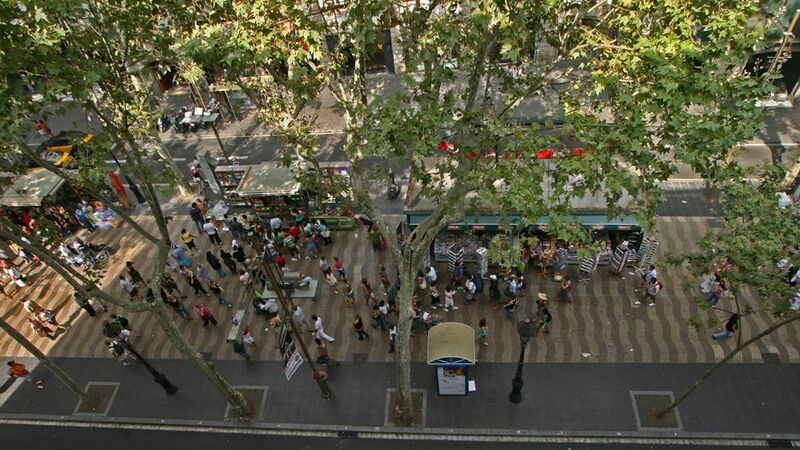 This is the urban commons at its best. I am perplexed by the almost complete lack of pedestrian streets in North America. 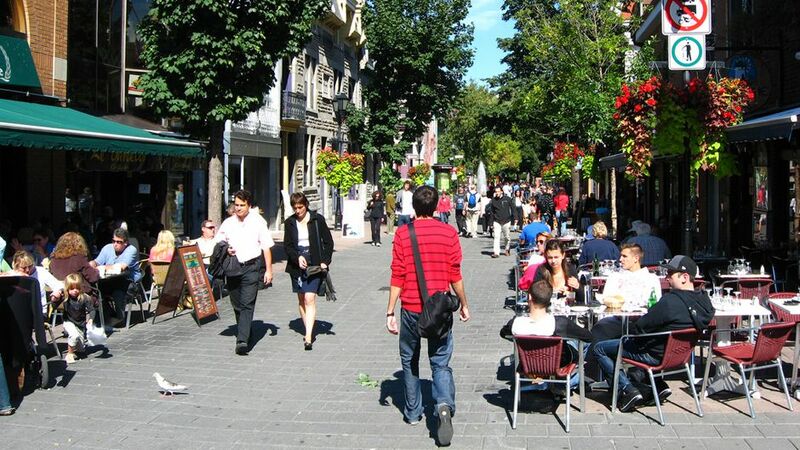 Why is it that car-free commons — designed for pleasurable strolling, shopping and hanging out — which have become as typical as stoplights or McDonalds in European city centers, are almost non-existent here? Look what we’re missing. The heart of many, if not most, German, Italian, Dutch, Scandinavian and, increasingly, South American big cities are bustling pedestrian zones that have become favorite spots for young people to gather, lovers to linger, kids to romp, women to show off their new clothes (and discreetly admire the looks of passers-by), men to admire the looks of passers-by (and discreetly show-off their new clothes) and everybody to feel part of the wider community. This is the urban commons at its best. Our one widespread experiment in reclaiming the streets — the downtown transit malls of the ‘60s and ‘70s — failed in most cases. That’s because they were usually desperate measures to cure sickly downtown shopping districts overwhelmed by competition from shopping malls proliferating across the suburban landscape. Another factor in transit malls’ rapid rise and fall is that they were not actually pedestrian places — big buses rumbling up and down the avenue quashed the carefree, car-free ambience that fosters exuberant street life. I am happy to report that I discovered a genuine Euro-style ped street in the most unlikely spot: Calgary, Alberta — a sprawling city whose economy depends on the petroleum industry. 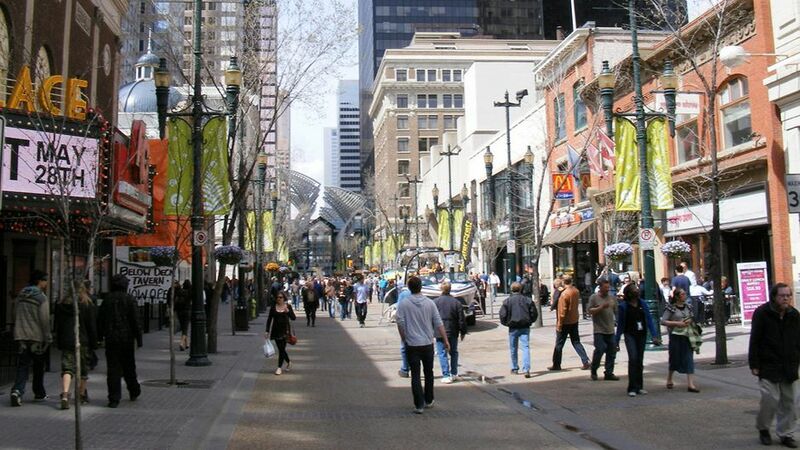 Right in the center of its downtown, among all the glass-sided skyscrapers and traffic-choked five-lane avenues, you can happily wander five blocks down the middle of Stephen Avenue, passing sidewalk cafes and swank shops, playful public art and bustling public spaces, unencumbered by cars or trucks. It felt too good to be true. Why surrender this delightful pedestrian oasis to traffic when there’s no pressing need? I can only guess it’s the principle of the thing. In North America, the rightful role of roads is to carry traffic, so even if you want to pedestrianize a few blocks during the day for shoppers and the noontime lunch crowd, you are obliged to welcome back the Toyotas and Lincolns in the evening. A local designer said that it was once 24-hour pedestrian, but in light of limited use over the long, cold winters, it was opened to traffic in the evenings. The notion that cars are the Kings of the Road is a relatively new attitude. For almost all of human history, the city street functioned as a vital commons welcoming all — it’s where carriages and streetcars traveled but also where youngsters played, teens flirted, dogs slept and everyone else chatted with their friends. That all changed between the 1920s and the 1970s, depending where you live, as motor vehicles claimed these commons for their exclusive use. We are poorer today because of this — literally in some cases because to experience the instinctual joy of hanging out in the streets you must travel to some faraway spot. Still, I am noticing a few signs this auto-cracy may be weakening, even in North America. The growth of traffic calming and bike lanes means that motorists are learning how to share the road. And many of us are getting a foot back in the street thanks to modest pedestrian projects being created — a block here or a half-block there in spots like Rocheter, Minnesota; Knoxville, Tennessee; and Charlottetown, Prince Edward Island. Don’t underestimate what can arise from these small beginnings. Even a short stretch of car-free pavement empowers peds to realize the road belongs to them too. Jan Gehl , the influential Danish urban designer who applies lessons learned in creating Copenhagen’s famous pedestrian district to cities around the globe, counsels people to start small and add to it bit by bit through the years. Another hopeful trend is the emergence of ciclovias — when a road is closed to traffic for a few hours so people can take over the streets for merriment. This bright idea was pioneered in Colombia, where networks of city streets are closed most Sunday mornings, with as many as a million people flooding the streets in Bogota on a sunny day. The tradition is now migrating north, with El Paso, Texas; Las Cruces, New Mexico; Cambridge, Massachusetts; and Ottawa, Ontario among the cities holding regular events. Minneapolis held it’s first earlier this month. I can’t tell you how much fun it was to walk and cycle right down the middle of what’s usually a busy street. This is a story from On the Commons. Wanted: Car-free North American Urban Commons by Jay Walljasper is licensed under a Creative Commons Attribution-NonCommercial-ShareAlike 3.0 Unported License. A popular speaker, veteran communications strategist and award-winning writer and editor, Jay Walljasper chronicles stories from around the world that point us toward a better and more enjoyable future. He is co-editor of OnTheCommons.org, a Senior Fellow at Project for Public Spaces and a contributing editor at National Geographic Traveler. Walking or cycling seems like exercise to Mayor Ford and therefore all efforts should be made to stunt these opportunities. It’s too bad because the dark shadow cast over the city by his obese shape eclipsing the sun will keep people from realizing what a truely unique and beautiful city Toronto is. Bravo to all of the rest of the cities moving in the right direction. First of all, I love your book, “The Great Neighborhood Book” with so many examples of how to reclaim neighborhoods and their commercial streets in one place vs searching the internet. Having just moved to Minneapolis a month ago, precisely because I wanted a city that was big on walkability and cycling without having to move to Chicago (I’m from Columbus) I can say that the bus & taxi presence on Nicollet Mall has not been an issue even for us cyclists, since it’s only one curvy lane each way and traffic lights are timed for stop-and-go traffic, not the consecutive green light pattern that the one-ways have. The buses are free along this stretch and the taxis are certainly utilized by pedestrians. Pedestrians can be found roaming the ten-block corridor day and night, even on the weekend and I’m sure the success is do to the mix of businesses here: daytime retail including a couple of urban big-box stores (Target and Marshall’s), while at night the independent restaurants and bars keep things going after the suburbanites have made their escape from the city: some even choose to hang around instead. It probably doesn’t hurt that there’s another multi-block stretch of Hennepin lined with destinations just next door, even though it’s certainly not car-free. Although Nicollet Mall isn’t totally car-free itself, it does offer a much more well-balanced main/commercial street than many other North American cities and serves as a compromise favoring pedestrians over cars. Even Chicago’s Michigan Ave doesn’t offer this level of pedestrian-friendliness (6 lanes of traffic divide the two sides of commercial offerings).